The parents of Paul Quinn, who was murdered exactly a decade ago, have spoken of their pain and distress at watching those they believe killed him move freely around south Armagh. 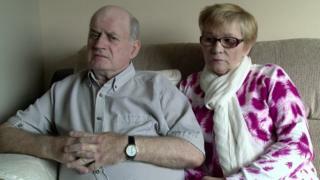 Stephen and Breege Quinn, from Cullyhanna, were speaking just ahead of the 10th anniversary of Paul's death. In October 2007, their 21-year-old son was lured to a shed in County Monaghan. There, he was set upon by a gang of men. The Quinn family has always blamed the IRA for murdering their son. The gang used nail-studded clubs and iron bars to beat him for upwards of half an hour, breaking every major bone in his body. He died in hospital two hours later. His mother said: "They crucified him. The doctors said they didn't leave anything to fix." Straight away after the murder, his family blamed IRA members, a suggestion echoed within a month of the killing by the paramilitary watchdog, the International Monitoring Commission (IMC). In its report in November 2007, the IMC said current and former members of the IRA may have been involved in the murder. The watchdog added that the attack stemmed from a local dispute but it was too early to say if it was authorised by the IRA leadership. Sinn Féin has always denied that the IRA was involved in the murder. Speaking this week, however, Stephen Quinn stuck by his family's allegation. "I would see those people [Paul's suspected killers] on a regular basis out and about," he told BBC News NI. "I've spoken to the Gardaí [Irish police] about who we know about, and who we don't know about, and the Gardaí know who did it too and it's exactly the same thinking as us; the same people as we're talking about." Martin McAllister is a family friend of the Quinns who has supported them over the years in their search for justice. He claimed the killing has been surrounded by "a flak jacket of lies". "The problem with Paul Quinn's murder, from the perspective of the gang who actually carried it out, is that it's not covered by any narrative here. "It can't be explained away by anybody, so subsequently, you are in a situation where you are in complete and total denial." He said Mr Quinn's killers followed up his murder almost immediately with an attempt to "assassinate his character", heaping more pain onto his grieving family. "This was in some feeble attempt to justify it - 'he didn't 'get it for nothing' type of thing," Mr McAllister said. "And that's a very, very difficult thing because people believe some of this. What happens is the sort of 'no smoke without fire' idea gets bandied about." Mr McAllister also claimed that a number of posters, appealing for information about the murder, have been torn down in south Armagh. A reward has now been offered for information leading to a conviction. The Quinns, however, continue to hope one of the large number of gang members involved in the killing will search his conscience and finally come forward to tell what happened. "We still have hope," said Mrs Quinn. "It's the only thing that keeps you going - hope. "Every day you hope for something or that someone will speak out. They just need the guts to come forward."